Identifying the types of contacts that result in disease transmission is important for accurately modelling and predicting transmission dynamics and disease spread in wild populations. We investigated contacts within a population of adult Tasmanian devils (Sarcophilus harrisii) over a six-month period and tested whether individual-level contact patterns were correlated with accumulation of bite wounds. Bite wounds are important in the spread of devil facial tumour disease (DFTD), a clonal cancer cell line transmitted through direct inoculation of tumour cells when susceptible and infected individuals bite each other. We used multi-model inference and network autocorrelation models to investigate the effects of individual-level contact patterns, identities of interacting partners, and position within the social network on the propensity to be involved in bite-inducing contacts. We found that males were more likely to receive potentially disease-transmitting bite wounds than females, particularly during the mating season when males spend extended periods mate-guarding females. 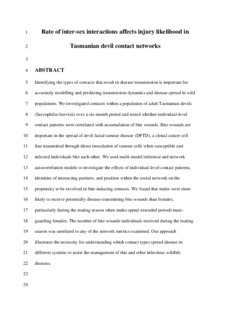 The number of bite wounds individuals received during the mating season was unrelated to any of the network metrics examined. Our approach illustrates the necessity for understanding which contact types spread disease in different systems to assist the management of this and other infectious wildlife diseases.